Local cuisine is a mix of historical cultural influences in Slavonia and Baranja and customs that have been brought by people who moved from the other parts of Croatia, from the Adriatic coast, from Zagorje and Međimurje regions or from the country of Bosnia and Herzegovina. On the menu you will find dishes that will remind you of the old Austro-Hungarian era, but also on the fact that the city is located at the transition from Central to Eastern Europe with a strong Hungarian, Slavic, Germanic and even the Oriental (Ottoman – Turkish) influence. Some of the daily meals that you would be offered for breakfast by the locals in their homes are cheese and sour cream (locally: sir i kajmak; sir i kiselo vrhnje) seasoned with ground red pepper. Local dishes for lunch are Čušpajz (stewed vegetables) and Sataraš (a light stew made of bell peppers, tomatoes, onions and condiments), minced meat, "Wiener Schnitzel", "stuffed" roast chicken with potatoes or dumplings, Sarma (minced meat wrapped in sour cabbage leaves from the nearby village of Čepin), pasta with cabbage (fleklice s kupusom), fried carp with potato salad and potatoes with pasta called "Grenadirmarš". For dessert you would be offered with strudels and cheese, apple or cherry pies, gužvara (rolled dough with poppy seeds and nuts), plum dumplings, šufnudle (type of gnocchi) in bread crumbs with sour cream, taške (pads made from potato dough) with jam, wrapped apples (in pancakes dough) or everyone's favourite light Šnenokle (light egg white dumplings in warm egg cream). At the time of Christmas and Easter locals will offer you small cakes like Vanilin Krancle (vanilla flavoured - flower shaped cookies), Parizer and Londoner šnite (“London” and “Paris” slices with lots of nuts), Žarbo - šnite (slices) or finely-made light donuts called “Krafna” (you can find them in the bakery crafts and bakeries). For aperitif before lunch you will be offered with fruit brandy (schnapps) or liqueur and with the dessert a cup of "Turkish" coffee is a must. In traditional restaurants, waiters will often offer you with some of the local culinary specialties which often contain red ground hot peppers as the main spice. The most common dishes are roast of venison (deer, wild boar) and freshwater fish (catfish, perch, carp, pike), “Perkelt” (type of goulash) made of fish fillets or venison with homemade pasta, cottage cheese and pieces of fried bacon, "Čobanac” venison stew, unavoidable “Fiš paprikaš” (stew of mixed fish), fish pate, pate with cracklings, “Kulen” (typical spicy sausage) and fruit strudel or dumplings with plums for dessert. Among the local small cakes, one stands out in particular and that's handmade traditional Croatian “Licitar” honey-cookie, which is proudly produced by protected arts craft from the Blažeković family. Thanks to their hard work and efforts of small domestic producers, Licitar (decorative honey cookie) is part of the world intangible cultural heritage by UNESCO. In pastry shops you can enjoy the taste of cakes, which have roots in the Austrian, Hungarian and Bosnian (Turkish) cuisine. For dessert in restaurants you will often be offered pancakes with homemade jam, strudel with cherries or plum dumplings. But if you're on a diet, be careful - dumplings are a heavy dish and they can be served as a separate meal! • Have you heard of "Knedl sat" (The Konedl-dumpling hour)? 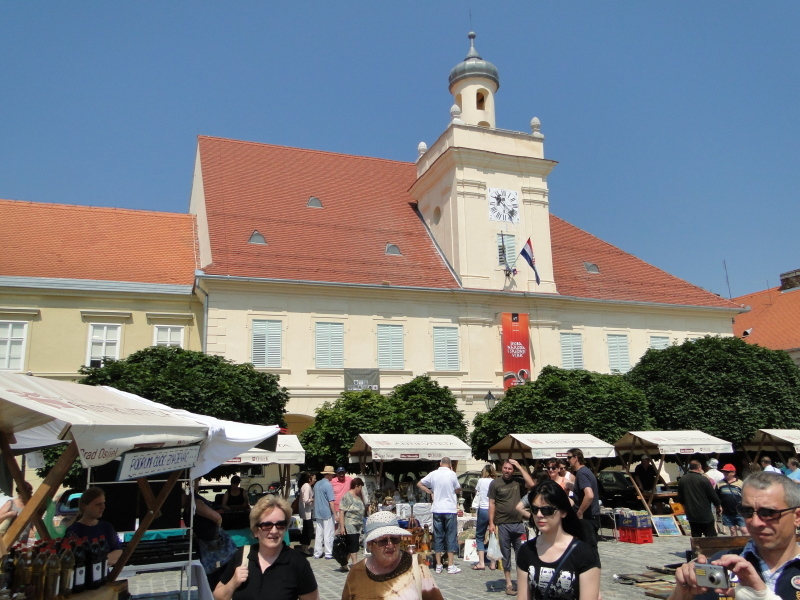 In the summer of 1526, Osijek was in the whirlwind of war and became a part of the great Ottoman Empire. However, at the great happiness of people from Osijek, on the Friday September 29th, 1687 at 11 o'clock the last Turkish soldier left the city and all the churches rang their bells and announced a long-awaited freedom. 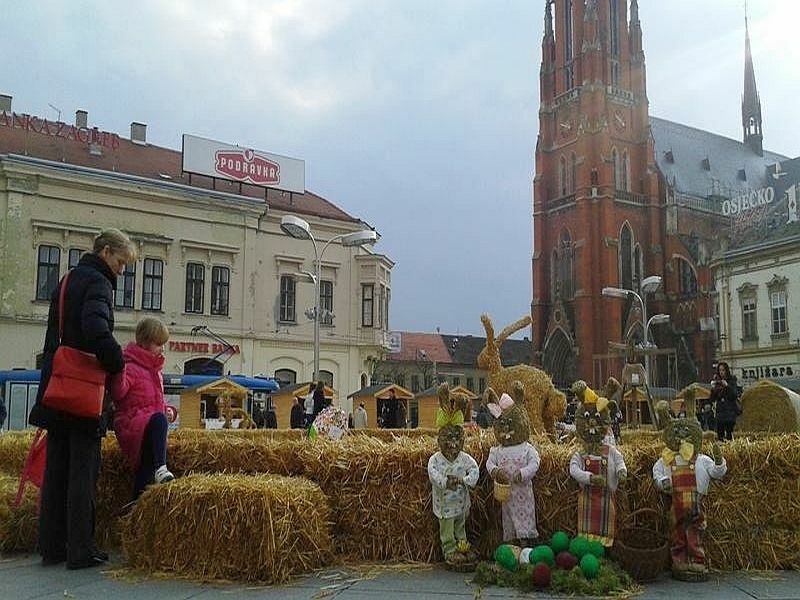 As the years passed by, the churches still rang every Friday to celebrate the big event but residents of the city of Osijek have forgotten the real reason ... Finally and practically, chefs in Osijek realized that that was the right time, "when all the churches say so", ideal for the preparation of one of their favourite dishes - dumplings, so that the entire lunch can be finished on time, by noon! And so, that eleventh hour on Friday became and remained known as - "knedl sat" (dumplings hour)! 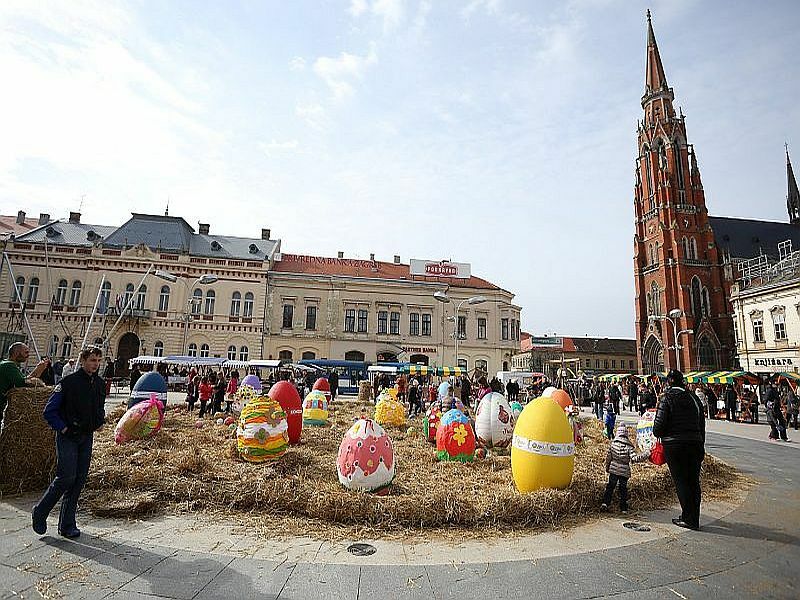 Osijek is also known for the production of biscuits and chocolate so don't miss the opportunity to try the chocolates made by Kandit and biscuit from biscuit factory Karolina. Our recommendation is wafer Jadro, a favourite cookie throughout Croatia and the neighbouring region. With food we recommend you to taste the first Croatian beer, made with pride since 1664. This is the first documented production of this favourite beverage. 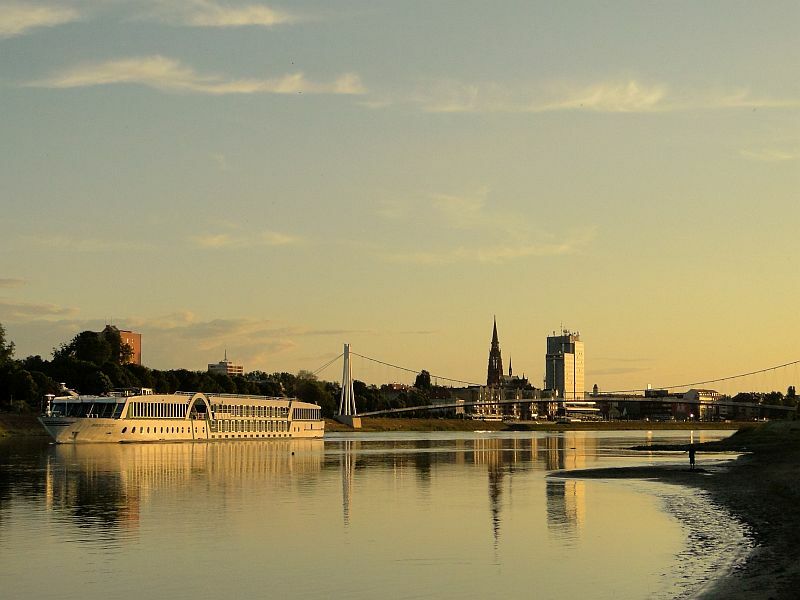 The first registered trade named Osijek brewery was recorded in 1697 in the Lower Town where it still stands today. Especially in the summer months refresh yourself with black Black Radler, which to our knowledge is only produced in Osijek. 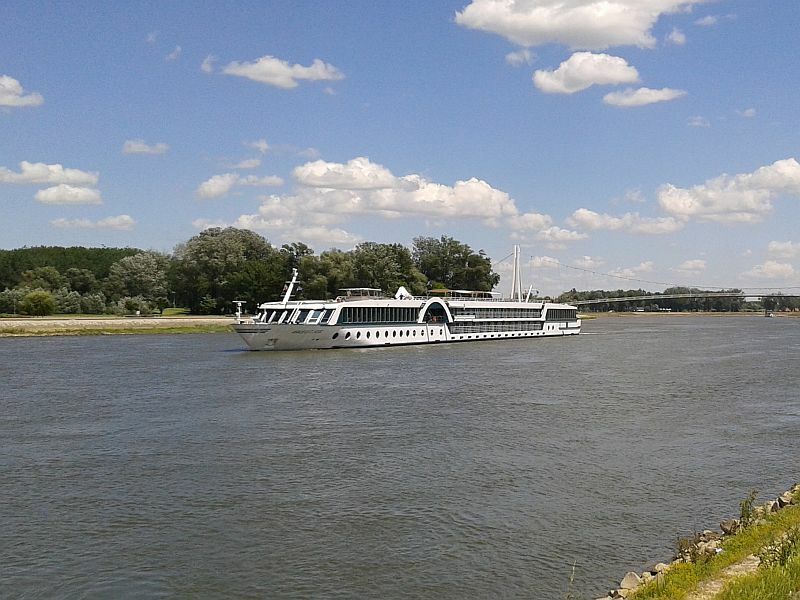 With local cuisine, wine will definitely go very well because Osijek is surrounded by famous vineyards in Đakovo, Feričanci and those on the Danube River, in Baranja and Erdut. Only 20 kilometres north of the city in the village of Kneževi Vinogradi is the third oldest and the largest wine cellar in Croatia from 1526. On the same distance east of the city, on the Danube River in Erdut there is guarding Gothic tower and a local winery with a huge wine barrel with a volume of 75,000 litters. Favorited wine varieties in both vineyards are white and black Pinot, Chardonnay, Merlot, Frankovka (Blau Frankisch), in Erdut a favourite wine sort is a delicious Zweigelt, in Baranja it's Schiller (blend of Frankovka and Cabernet Sauvignon), and the pride of every winemaker, golden-green, sweet and refreshing Graševina (Italian Riesling).